The take-out monster!!! This was for Mr. FW’s bday a few years ago, so fear not, it was planned in advance :). Eating out, take-out, restaurant meals, dining out, take-away, delivery… whatever you want to call it, not preparing your own food is the #1, top, chief, primary, far and away most commonly cited roadblock to frugality. Without fail, this is the most frequent question I get from readers. Without deviation, this is cited as the largest area for budgetary improvement. And without alteration, this is the toughest thing for people to modify in their quest for all-encompassing frugality. And I feel this pain keenly–it was the most challenging thing for Mr. Frugalwoods and me to give up as well! What is it about food prepared by other people????!!!! Since we have thousands of Frugalwoods readers participating in the July Uber Frugal Month Challenge, I wanted to provide a robust set of resources and suggestions on how to overcome the take-out monster. I polled the ever-brilliant minds of our devoted Frugalwoods Facebook group to bring you this month’s rundown on a topic nearest and dearest to our frugal hearts: the art of cooking at home. For every meal. Every day. Of the year. Ok that’s a tad extreme, even Mr. FW and I eat out about once per month. But you get the idea. I’m going to bust out my old Frugalwoods adage here that food is a necessity, but expensive food is not. And while I’ve devoted reams of the internet on how to shop for groceries efficiently and frugally, eliminating take-out and dining out is BY FAR the most significant impact you can have on your food-related budget. We all know that eating out is a raw deal, but we do it anyway because it’s easy and it’s tasty. I don’t deny that. But I do challenge you to consider if all the money that gets eaten up every month by take-out is truly worth it to you in the end. It’s not facilitating your longterm goals (financial or health-wise) and it’s not a productive use of your hard-earned bucks. if you’re not sure how much you spend on such culinary conveniences each month, then it’s time to start tracking your expenses, which you can do with Personal Capital, a free expense tracker that I use and recommend. And if you want still more, check out my entire section devoted to FOOD, glorious food. Take-out lunch because I failed to plan ahead and didn’t take my lunch to work one day! Before we get to the braintrust’s tome of suggestions, I must highlight that the #1 reason cited for eating out is a failure to plan ahead. There’s nothing wrong with enjoying a planned, agreed-upon-in-advance, special dinner out. It’s delightful to plan for it all month, anticipate what you’ll order, and then truly enjoy yourself. But scrambling to order sub-par Thai at 8pm on a Tuesday because you forgot to go grocery shopping? That’s what needs to stop. Fear not, however, for many a frugal acolyte has gone before you and successfully vanquished the take-out beasty. So take heart and you don’t have to take my word for it–take theirs! With over 124 responses to this query, I can tell you this is one popular, and oft-considered, frugal topic. I couldn’t include everyone’s response below, but you can check out the full conversation on Facebook. Sevilla shared, “I’m a really good cook, and very picky about what I eat. I’ll only eat out of it’s something better than I could make myself, or as a specific social evening, friends visiting from out of town for example. My mom and I were reminiscing the other day about how in first grade I tried the school lunch on day one, packed my lunch on day two, and never looked back!! Lauren enjoys the process, “When I make my meals myself, I can add precisely what ingredients I like. I am a picky eater with food allergies, so eating out isn’t an ‘easier’ experience for me. Cooking doesn’t have to be a chore. Make things you enjoy eating! Frozen pizza to the rescue! Anne’s strategy is, “Remembering that simple, fast meals like BLTs or grilled cheese and boxed tomato soup are DELICIOUS.” Yum. Jenny kept it real for us, “My tip is to acquire a couple of small children. Restaurant visits will never be the same again, so that is that taken care off. Take-aways they don’t really eat it, and I hate food waste. Also, it is much quicker to run up to the supermarket 5 min away to get a pizza and run it in the oven for 15 min than to wait for takeaway.” I can concur that dining in a restaurant with a small child is, uh, interesting at best and cataclysmic at worst. Why torture yourself?! 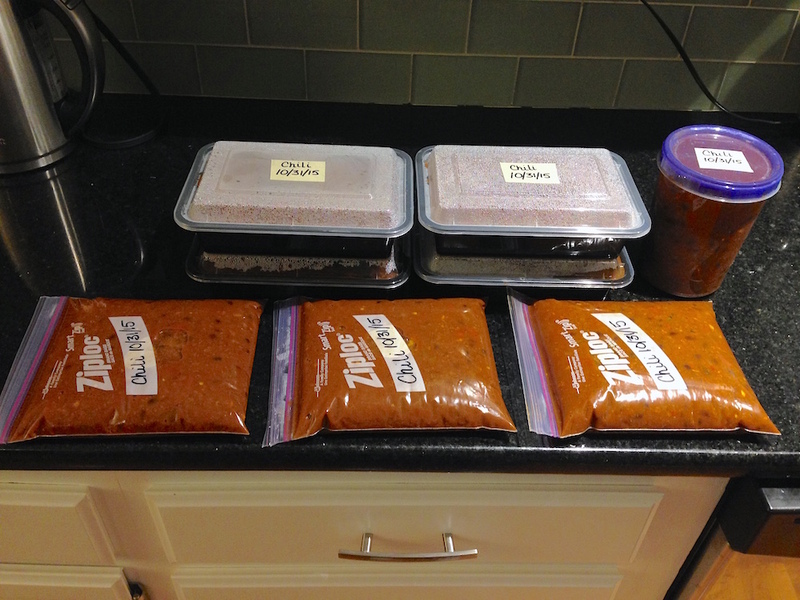 Crista reports, “We cook large batches and freeze the leftovers… also, keep a few easy prepackaged, and shelf-stable foods in the house (pasta & sauce, vacuum packed Indian meals), that we consider our emergency supplies. These can serve as an alternative to eating out in rare circumstances when we just don’t have anything frozen, or are otherwise not able to prepare food from scratch.” I love this approach! While pre-packaged foods are usually more expensive than cooking from scratch, it’s much cheaper than take-out, so I consider it an excellent frugal plan. 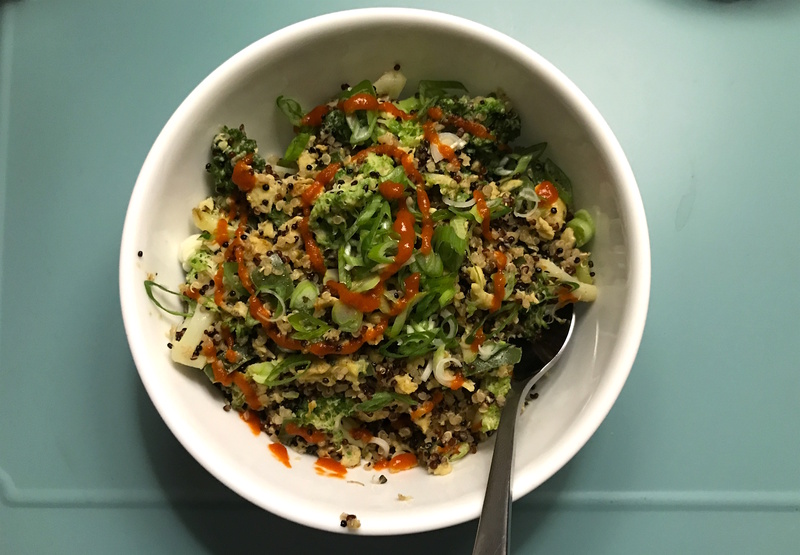 Kim shared, “For one, I thought about how much I actually liked the takeout I was buying and realized that a lot of it wasn’t that great, it was just convenient and not all that healthy. Then I learned how to cook and challenged myself to regularly try new recipes. Now, the food I make at home is a lot more appealing than eating out, and cooking is kind of a hobby. Then I stepped it up a notch by making freezer meals ahead of time. If I’m not in the mood to cook, throwing some freezer food in the microwave is a lot more convenient than going out and getting takeout. I’ve even made bread mixes that can be thrown in the bread maker quickly and timed to be ready when I wake up in the morning. 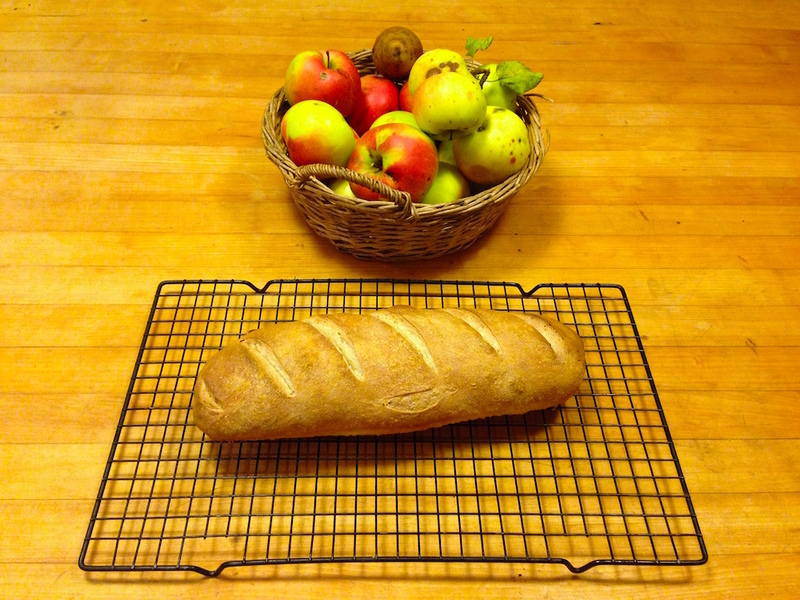 Fresh bread is a lot more appetizing than a bagel sandwich from the coffee shop. I haven’t totally mastered appetizing work lunches. Someone asked about how to remember to take your lunch to work… My trick is to leave my car keys in the refrigerator with my lunch – problem solved! An old roommate laughed hysterically when she saw me do this the first time, and within two days she was doing the same thing.” I love it! Melissa wrote, “I’m single so sometimes I’ll make a big something and eat it all week. Other times I’ll just catch as catch can…. homemade hummus and veggie burger on tortilla, some ramen with veggies and soy sauce… expectations for myself are pretty low!” Mr. FW and I eat hummus and veggies for dinner all the time, so our expectations are similarly low ;)! Kelly has tasty advice, “We keep taco fixings in the house at all times. It is our easy and cheap meal for when we do not feel like cooking. Because we love the crock pot carnitas recipe that is usually the filler, this isn’t really a hardship either.” TACOS to the rescue! Erin shared, “I always have frozen pizza at home and our busiest day of the week I have a crockpot of beans on and we have fixings for burritos. So no temptation to stop and get burritos! Also, a family of 6 costs a lot to eat out, even quick food, so that stops me as well! I also pack snacks any time we go out, because I swear the kids are always hungry! 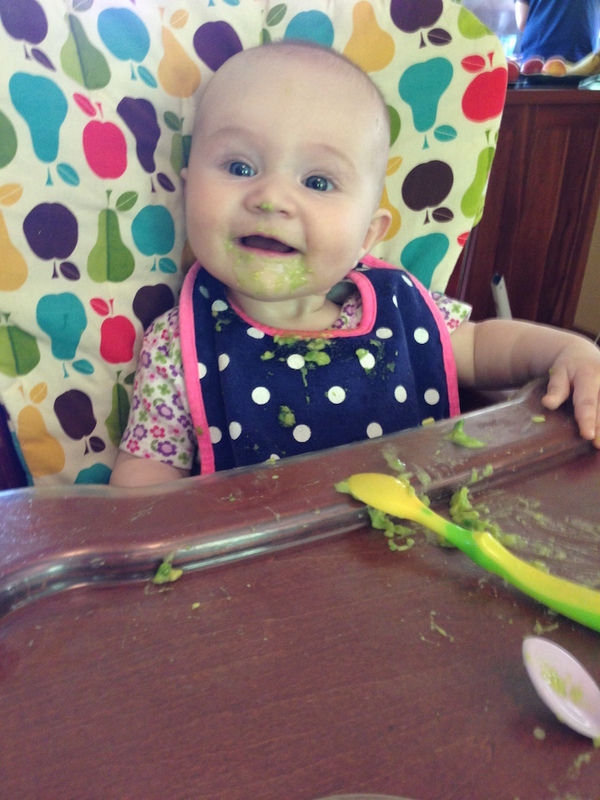 I menu plan but also have some quick/easy options around if I need it.” Yes, kids (and parents!) are always hungry at the most inconvenient of times. Packing snacks will save you every time! Natalie says, “I use the old standby trifecta: crockpot, meal prep and pantry/freezer goods. Works every time! Elyse shared, “I write out a menu every Saturday for the upcoming week, which also helps with making a grocery shopping list. We know we never want to cook on Fridays at the end of the work week, so I have been putting frozen pizzas on the menu for Fridays in order to avoid the drive-through.” I love this planning ahead approach for Fridays! Know yourself and your limitations! 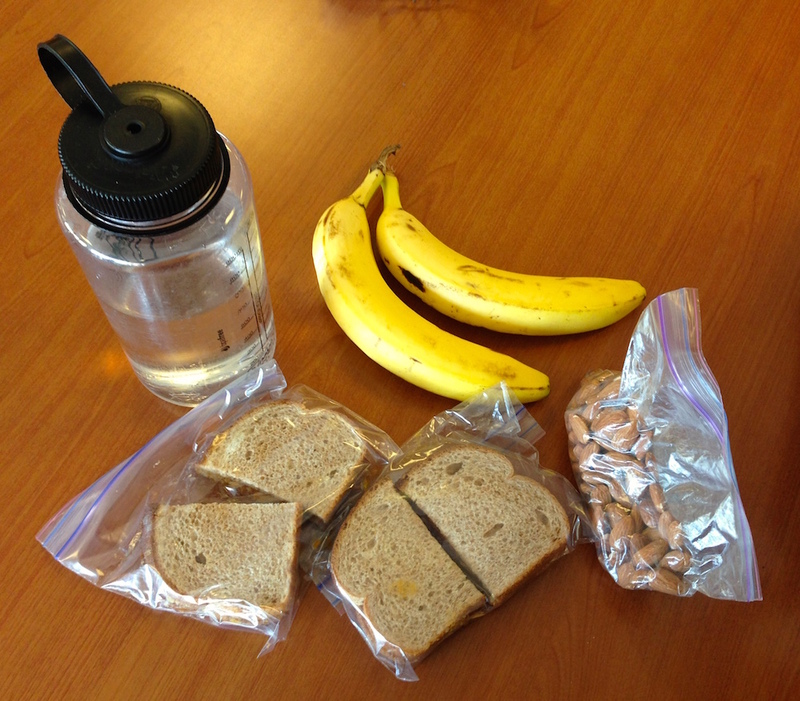 Leah wrote, “I pack my lunch the night before. Sometimes, it’s leftovers. Other times, it’s a carefully made salad. Doing this in the evening avoids the morning rush and excuses.” Love it. Sammi said, “One simple rule that I try to follow religiously: Don’t leave the house without a snack. Ever.” I am with you 100%!!!!! I do not go anywhere without snacks. I even take them on hikes around our land! Carissa wrote, “We NEVER make single portion meals. Everything is big enough to last us both for at least 3-4 meals. We have no problem eating leftovers, and it’s great to just reheat delicious home-cooked food for lunch or dinner.” Agreed. The near-universal advice I gleaned from these 54 selected reader responses is that you’ve got to have ready-made meals on hand either in your freezer or your pantry. I keep both frozen pizzas and frozen leftovers of meals cooked by Mr. FW in our deep freeze. 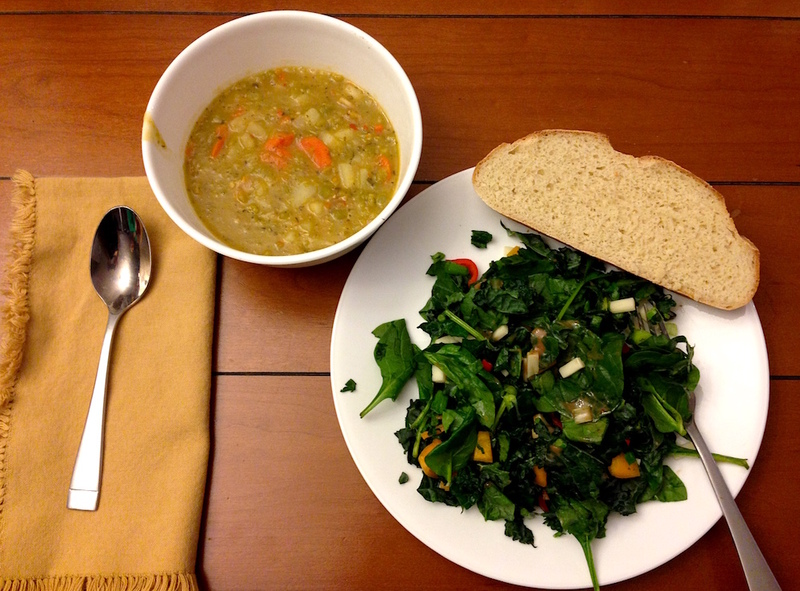 On hectic nights, we pull out a bag of homemade frozen split pea soup or heat up a pizza. In some cases–i.e. the pizza–this option is not healthier or cheaper than cooking from scratch, but it is cheaper (and likely healthier) than ordering take-out. Leftovers are frugal take-out. You just take them out of the fridge/freezer and enjoy! Perfection. Don’t delude yourself into thinking you’re going to prepare gourmet meals every single night of every single week of every single month. Have prepackaged meals on hand or cook in large batches and freeze the leftovers. Saying you’ll never resort to these is setting yourself up for almost guaranteed failure. I’m a big fan of knowing one’s limitations and making contingency plans in advance. We had a baby and were in the NICU with her for a week. We spent the day in the ER with a sick Mr. FW. In none of those instances did we resort to take-out because we were prepared with food in our freezer. From single folks to families of multiple children, there’s a strategy contained in the above list for everyone. It takes a bit of planning, a bit of preparation, and commitment to stick with it, but it’s entirely possible to never order unplanned, last minute take-out. Of course, you could always follow our approach and move to a place so rural that nowhere will deliver to you and with no nearby restaurants (suits us just fine), but you can also pretend that’s the case no matter where you live. When you remove take-out as an option–as we did when we lived in the city and had 1 million delicious restaurants within an arm’s reach–you’ll be amazed at how possible it is to never order in. Choosing to eat out or order in on special occasions is a great choice, but what’s not a great choice are last minute, frantic calls for take-out. How do you avoid eating out? Eating out is definitely one area Mr. FAF and I have struggled with to lower our expenses. We eat at home most of the time and only eat out once a week. But I still want to reduce the frequency to once a month or every couple of months. Not having food ready is one reason why we eat out. But another reason is that there are dishes that we just can’t make as well as restaurants do. Mr. FAF and I are Asian, so we usually go to Asian restaurants where they serve foods that are just too complicated to prepare or cook well. However, we have decided to improve our cooking skills by following Youtube videos and possibly taking inexpensive cooking classes. I really love that you and Mr. Frugalwoods have successfully cut your eating out budget to a bare minimum! I agree with you here Ms FAF. I don’t eat out often, but once a week sounds about right if I averaged the year. As long as I’m not being extravagant, which I’m not, then I think that’s plenty. It is totally worth the money to take a cooking class. Every once in a while my fiancé and I will sign up for one. It is a fantastic way to learn new cooking techniques and open up a whole new world of recipes. I would love to take an asian cooking class but can’t seem to find one. These are great ideas! I have not been consistent on freezer meals in the past, but I remember reading your previous post about eating out and immediately stocking up on a few emergency meals (frozen pizza, canned soup, etc) so that I have at least a few last minute meals on hand. With a young son (almost 2), I recently re-discovered how great PB&J sandwiches can be. Even if we just plan to head out in the morning, I typically whip up a few sandwiches, add a few sides (applesauce, veggies, apples, almonds, granola bars) and bring this along with us. This trick has saved me from eating out several times when we end up deciding to enjoy the day and stay away from home longer than expected. My wife and I love using the crock pot. It’s so easy to throw all the ingredients in there and then forget about them until it’s time to eat at night. If we didn’t crock pot we would definitely spend way more money eating out. I always believe that as long as you budget for things, it’s okay to spend on them. But, I do agree that eating is out is easily the one part that could always be cut back. My wife and I work opposite shifts so eating out is always a nice thing to do to spend time together. It’s usually limited to once a week. However, come weekends, there are many times where we don’t have meals plans and we end up eating out. Now with a newborn, I want to get into a better habit of eating out less. Planning ahead!! Meal planning, grocery shopping, taking an inventory of the food we already have at home and need to eat. Inevitably, if I plan ahead, we eat out less, waste less, and spend less money at the grocery store. Planning ahead when life gets really busy is what I struggle with, but this article is a great reminder to make planning ahead for the grocery store a priority no matter what! I believe this is one of the main causes of eating out. When there’s no plan the easiest thing to do is go to a fast food place to eat since it saves time. However, if you had a schedule of the meals you plan to prepare each week along with the ingredients it would be easy to make those delicious meals at home. Oh, let’s not forget you save some money too! I’m sorry but I couldn’t disagree more with Jenny. I have 3 kids and we tend to eat out a lot, just because we enjoy it and like trying different places or just hitting up our local faves. My kids are ages 1, 5, and 8 right now and because we’ve ate out so much, taking them to restaurants is not a problem at all. Now, we could save more money obviously eating in and should probably do it more, but that doesn’t mean going out isn’t fun and enjoyable. Even though you can obviously save time and money at home, what you DO get eating out is the fact that you’re not doing any work! You don’t have to cook it. You don’t have to clean up the mess. Etc, etc. Outside of the great advice listed above…. I also compromise with my wife who LOVES to eat out. What I will do is head over to Whole Foods and get a nice cut of meat or fish, some prepared sides for under $20. I’ll prepare at home, but it has a restaurant quality feel to it and a more high end feel than a typical dinner in our household. She is happy for the nice food, and I am happy to not pay $80 for the same meal by going out. YES YES YES! Preparation is the key to keeping that grocery bill low! You’re right, if I don’t plan ahead, I always spend more money on food during the week. If I do go out to eat, I definitely don’t buy drinks or get the expensive entrees. The overarching best advice is to never let your family think that objecting to leftovers is permissible. My sister-in-law tosses amazing quantities of food because “my family doesn’t like leftovers”. It is hard to believe she grew up in the same household as my husband, who will eat the same thing night after night if he likes it. I totally agree! Eating leftovers (or popping them in the freezer) is a requirement! Not only is it expensive to waste food, it’s also terrible for the environment. I don’t understand that mentality at all. 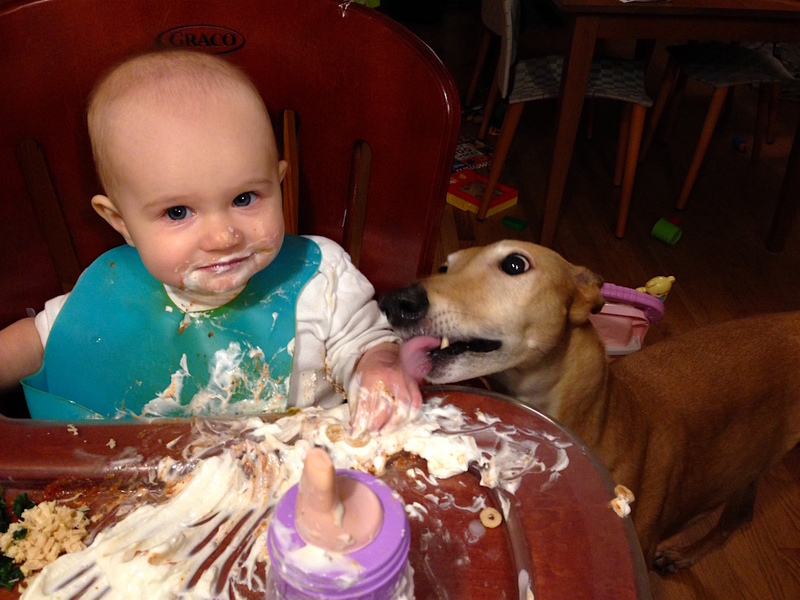 I mean, if you like – say – spaghetti bolognaise… then presumably you will… like it again another time, yes? It’s not like the left over food is a completely different-than-normal food. I just don’t get it at all. And I REALLY do not grasp or accept the mentality that thinks it’s okay to just throw out decent food. Okay. Maybe you don’t want it for whatever bizarre reason. Fine. Repurpose it, find someone to give it to, package it carefully, label it, put it in the freezer. The end. 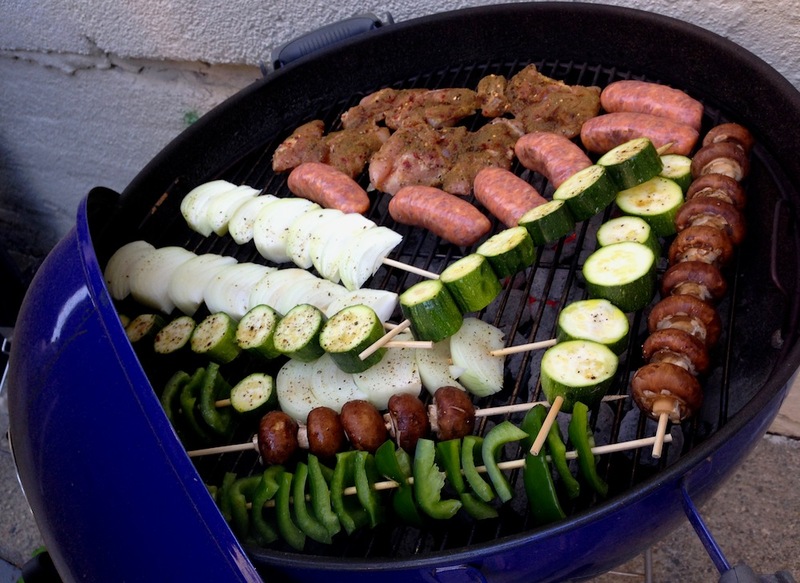 I have ended friendships – not with an argument, just realising that there was a vast gap between us – over someone happily throwing a whole platter of left over barbeque (braai!) into the bin. Meat. Chops, steaks, sausage. In the bin. The bin. I stood there and gaped and was too stunned to say anything other than WHAAAA…. Becoming a mystery shopper is a great way to get in some free meals out. I use mystery shopping to go out to the movies as well. The job pays for the movie and snacks! It does require collecting information and writing a report after, but I’m sure most people here find motivation in frugality, so it’s not that much effort for some freebies! Also I think what hurts people even more than eating out, is getting alcoholic drinks at restaurants. Add beers or mixed drinks to your night out and it costs about as much as another meal! I can’t believe it when I’m out with friends or see people around me ordering two drinks with dinner, YIKES! Water please! 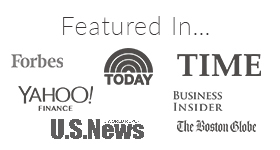 Erin – who do you do your mystery shopping through? I would be super keen to do this but don’t want to get scammed! I totally agree with Jenny! We have 3 kids and dining out is usually insane. On the occasions we do eat out, we pack meals for the kids in lunch boxes. Kids so often decide they don’t want the food after buying it, so this way we can easily repack it and they can eat it for their next meal. Plus, he kids feel special carrying their own lunch box! Dining out used to be our biggest problem area! It mostly boiled down to what everyone else said: a failure to plan. Specifically, we’d eat lunch out all the time, and buy snacks at work outside of the lunch period. One thing that’s helped me cut down on buying snacks at work is to keep a giant tub of nuts at my desk. I’m not a huge nut eater, but if I’m hungry they taste as good as anything else. It keeps me from wolfing them down too fast otherwise, but it’s also an acceptable snack for when I really am hungry. 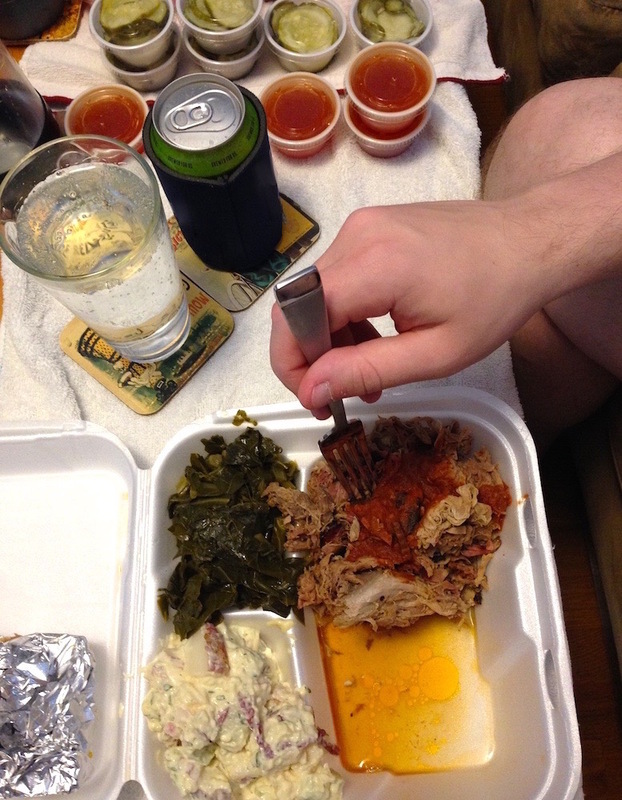 That top pic looks just like the Blue Ribbon BBQ – yum – ! That aside, great post! With my four kids in four different directions after school doing sports it gets really hard not to eat out when you get home at 6:30 with everyone starving! Crock pot and pasta! Also thanks for the great tips! In fact it IS Blue Ribbon BBQ! That’s where Mr. FW always wanted to get his birthday meal back when we lived in Cambridge :). Love it! And miss The Blue Ribbon as we are now living the suburban life! But we do treat ourselves every few months when we head into that area! 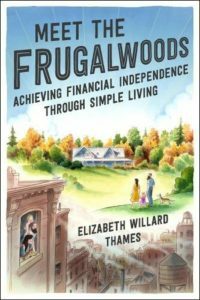 So many great suggestions from the Frugalwoods community! I second the going vegan, we (mostly) avoid animal products which makes going out almost impossible. I’ve been working to master having frozen leftovers available for when we get in a pinch, but it seems like we eat them faster than I make them. I only shop sales, but when it’s a good deal on what we will actually eat, I’ll definitely stock up – including box dinners. That means I have ready-to-go meals in my pantry, and meat in my freezer. By the time we’re running low on Hamburger Helper (don’t judge! ), it’s usually on sale again. We also are saving to move to Denver, so when trying to make a decision, we run it by the filter of “is it worth delaying Denver?” and even if it’s $20, we’re that much closer to our goal! Love all of these! I 100% agree too – being proactive and thinking ahead is the best way of making sure you stay committed to not eating out. Removing temptation is key too… I used to have a ‘candy stash’ in my car! Instead of pulling over, I’d munch on some sugar to tie me over. It’s since been replaced by nuts to make it a bit healthier (ah, to be a teenager again), but the principle holds! Thanks for the post! I go with the general consensus — have a pantry or freezer meal ready to go, and use that crock pot. It really helps. Another thing we do, especially when we are hot and exhausted from working in our yard in the Florida heat — hard boiled eggs, fruit, cheese, crackers, easy salad…. something cool to eat and easy to get on the table. And for those who like eggs (I sure do), an omelet filled with tomatoes, bell pepper, chives, cheese, ham, what have you, is a super easy meal. You can keep chopped bell peppers or ham and shredded cheese in the freezer, can rehydrate dried tomatoes, and keep chives growing in the house (ours live year round outside in Florida) so that the fillings are always handy. I totally agree with Jenny! Kids and dining out make for a circus, and not the fun kind usually. When we do eat out, we almost always pack lunches for the kids. Th chance of kids not eating what we buy is high, so this way we can just repack it and take it home for their next meal. Plus, they like carrying their own lunchbox. There is another hack I didn’t see mentioned so I’ll chime in. I live by myself so a huge caveat that yes it is easier for me, no partner, no kids. First, a bit of context: I learned a way of eating that works for me over twenty years ago. Dr Atkins (yes, the Dr Atkins) was my physician and I embraced low carb, which naturally progressed into what has come to be called paleo and at times ketogenic. I am 62, work out (HIIT) four times a week and take no medicine for anything. Been sick 2x in 20+ years, and even that was mild. So it works for me. As to meals, if you haven’t made something just don’t eat. In my case, most days I eat in a 5-6 hour window. So fewer meals, less need to prepare, fewer opportunities to stray…..you all get the idea. Again, if you eat 5-6 times a day PLEASE look into why this is a bad idea. Save time, eat more healthfully, eat less often. 100% agree – I didn’t include this because so many people are indoctrinated to “breakfast is the most important meal of the day” story. Read “The Obesity Code” and it has changed my life. I eat 2 meals between 10am and 6pm and have lost 20 lb in 2 months. It is resetting my insulin levels and I am rarely hungry. Yes, I was about to comment about intermittent fasting, too! It’s easy to not eat out for breakfast and lunch if you’re used to skipping them! 🙂 Instead, I “break-fast” at 3pm everyday. I also love Sage’s comment that being a vegan is how to stop eating out. My household is also vegan and not only does that limit our restaurant options, but it also lowers our grocery bill! These are great suggestions! A few months ago I read one of your posts about keeping frozen pizzas on hand for emergencies, and since then I’ve religiously picked up a box of frozen pizzas at Costco when I go (or veggie potstickers for the summer when it’s too hot to turn on the oven). It’s amazing how many Thursday or Friday nights those have come in handy when I get home fairly late and am too exhausted to think about how to feed myself. Smoothies are also very handy in a pinch-my freezer is always stocked with berries and spinach. My tip is to have the proper spices on hand to make your favorite foods. My husband and I love Indian and sushi. The dishes seem so complex in the restaurant, but in all actuality, as long as you have the right flavors going, a lot of it is stupid simple. You can make bland budget food like rice and beans a million times more interesting by adding different spices. I feel like a lot of people get stuck in an onion/garlic/salt/pepper rut, when there’s a wonderful world of cardamom and cumin and smoked paprika out there. Along that route, my very very un-PC tip is if you want to make something that tastes authentic, using Indian for example, find the most authentic looking/sounding Indian cooking channel on youtube. I have yet to be disappointed, and there really isn’t a favorite restaurant dish that I can’t recreate at home using that method ( my favorites are Get Curried, Fortune Cooking, and SORTEDfood). Other than that, the reality that hey, we’re in debt, going out to eat is basically eating a salad made of dollar bills…that keeps us happily eating at home. First of all, I love you Frugalwoods! You inspire me and have helped me feel lighter, with the discovery that I’m capable of enjoying the beauty of a simple life free from the anguish of endless desires. I’d like to add a point that been fundamental to my success of keeping my meals frugally homemade. Adequate sleep! When I go to bed late, I don’t have energy to cook in the morning. Nor the night after. And the vicious cycle begins. The question “what is it about food prepared by other people” makes me smile. Well there is a lot to love about it! But this reminds me of how homemade meals can (and did) turn me off at times, and that’s presentation. Food that fills up my thermos container can look and smell disgusting at first sight, when compared to how it’s served in restaurants or even in a takeout box. Funny how the perception changes when the food is probably similar. Although I can get round this by pouring my food into a bowl or plate, I don’t really need to do that now. First, I still remember how my food was absolutely enticing when I was cooking it. Remember the positives …… Ultimately, any qualms I have dissipate under the contentment and joy that I feel about my ability to live like this. Saving up for my dreams, eating satisfying food without hurting my finances – what CAN get better than that? To our dreams and everything worth saving up for!!!!!! Would you share your recipe? That sounds delicious! Wow, this is an impressive list of suggestions. I’m pretty lucky in that my wife is committed to doing a whole bunch of meal prep on the weekends which means we’ve got lunch for the whole work week in tupperwares and most of our dinners covered, too. It really takes the pressure off during the week to not have to worry about where meals are coming from and totally removes the temptation to go out and spend extra. One hack not mentioned here- the Instant Pot! I got one as a gift from a friend (full disclosure- did not buy it on my own), and its fantastic. I can cook beans in 40 minutes and rice in 10. I still use a traditional crock pot because the crock pot lets steam out while the instant pot doesn’t let as much out. I can put some chick peas on to cook when I take out the dog, and by the time I’m home, beans are 3/4 done. I use the beans and liquid to make homemade hummus. Likewise, other beans go into soups and salads (or make awesome “spreads” like black or red bean spreads). I also eat a mostly plant based diet, and as a competitive runner (15 + miles per week at the moment, but I’m in marathon training so that goes up almost weekly) I need some good healthy alternatives to packaged food. I’ve also noticed another commonality is attitude about food. Food can be amazing. I love to eat a really really good meal. But I’d rather go to Abe and Louie’s once a year for an amazing steak and eat mostly vegan and homemade for the rest of the year, than get bad takeout. But food can also be simple fuel for the rest of your life. So veggies, hummus, soup, pasta….. these are all things that feed your body when your soul can’t handle cooking a 7 course tasting menu (as most of ours cannot!). I’ve enjoyed reading everyone’s thoughts! My husband & I work opposite shifts & I’ve just came back to work from maternity leave. With 4 kids we don’t even have time to go out to eat. Of course my crock pot is running today (chicken, carrots & potatoes). It’s encouraging to see other people doing the same! I find that having a rotation works great, if you’re fine with repetition. I eat the same thing for breakfast every day, the same thing for lunch at work and then I have a weekly rotation of meals (e.g. week 1 is this combo, week 2 a different combo, etc). So much easier to grocery shop and keep food waste low once you find the right meal combos. With all the ingredients on hand, it’s way faster to make my meals at home than to stop at even a fast food restaurant. You just need to make sure that the meals include a variety of fruits and vegetables so they’re healthy. I agree with the person who stated that it’s easy to not eat out when you’re vegan. Although not technically vegan, I prefer not to eat meat or dairy and that means very few options when eating out. I do a massive cook session every Sunday, and it generally lasts my household of two until Friday night. Then Saturday we cook up a special meal, or we visit family where we all eat a special meal together. Then back to cooking again Sundays. Because our weakness has always been getting tired of the same ol’ food (which led us to ordering takeout in the past), I like to cook “adjustable” meal ingredients. For example, shredded chicken in the crockpot can be used on top of salad one night, in tacos the next, and with a quick pasta the night after. The pre-shredded and washed veggies go in the salad, some of it for the tacos, and some of it for the pasta. So it never feels even remotely like the same meal, even though I’m using the same ingredients which were also all prepared the same day! Plain rice one night can become an egg-based fried rice a couple days later (a proper fried rice tastes best with 2nd or 3rd day rice!) Pasta one night can become a casserole or pasta bake the next. Sweet potatoes can become sweet potato mash which can then be mixed with flour and made into sweet potato muffins. I find pre-washed veggies, ground or shredded meat, and a plain carb (which herbs and spices can be added to later, according to whichever dish you are morphing it in to) are the most versatile, and making a completely new meal every night with them takes less than 15 mins! Completely agree with the ‘adjustable ingredients’ model. I on Sundays I will carmelize a bunch of peppers and onions, saute spinach, chop veggies, roast some veggies, etc. As you say, that way you have prepared a bunch of things that can be mixed and matched. I highly recommend roasting a bunch of root veg, etc. especially in cooler weather. They are great sides and salad toppers, plus mashed together they make a great hash with poached eggs. 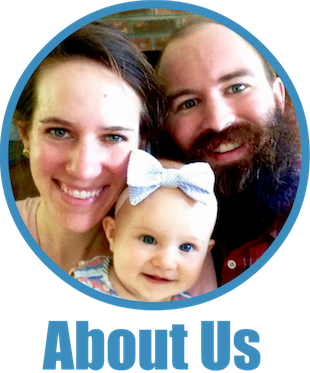 Having kids and then looking at your budget solved it for us. We used to eat out all the time (nice places as well as casual). Every so often I can see my wife pining for the fact that she only has eaten at a handful of the top 100 restaurants in the area. Then I point to the kids and remind her that they are reason we had to give it up (because daycare is insanely expensive here, about 17k per child for a mid-level daycare). My tip for eating in is to always have some frozen convenience foods on hand (pizza, stuffed chicken breast, ravioli) that I get for cheap at Costco/Bj’s (we do have a chest freezer).. It may not be the healthiest, but when you are close to ordering takeout, it is a lifesaver in convenience. I also crockpot basically everything now in the summer. I’ve actually learned I prefer cheaper meats in the crockpot (so long as they are cooked on LOW) because it helps break down the connective tissues better and you end up with tender meats that fall of the bone and cartilage. Chicken legs in the crockpot on low 8 hours are so much better than baked in the oven for two. Lastly, I just saw this woman on a PBS cooking show this past weekend who did a cookbook on Taiwanese food that had me interested–Cathy Erway–who also has a blog dedicated to eating-in in NYC! I don’t know if you’ve heard of her but her other cookbook, The Art of Eating In, was based on her not eating out for 2 years while living in NYC. I am going to try to get it from my local library, seems like it’s up the frugal alley. We do a lot of the things already mentioned. Recently, it’s too hot for us to turn on the oven, so I’ve had to change some of my routines (always a challenge! )…still figuring out how to maintain a balance between convenience, nutrition, food diversity/boredom, and all the other factors that make this work for us. Given our weekday division of time/labor, I’m the person responsible for most of the shopping, cooking, and meal planning. It shows — while my partner is still limited to the same three basic meals he could cook in college, I have managed to master increasingly flavorful and complex meals, so our quality of eating at home can be pretty high. BUT, meal planning/cooking just aren’t that personally satisfying for me: I can do it, I sometimes enjoy it, I just don’t relish it, and get pretty burned out after awhile. So, part of my plans include one-or-more nights a week where my partner cooks dinner. It’s never quite as cheap as the more inventive things I’ve learned to make, and tends to rely on processed foods a bit more, but we both benefit from this system. He made overcooked spaghetti last night, and you know, I really appreciated it. Secondly, and less thriftily, we look for the best deals in our town for eating out. E.g., there’s a local place that I can go to on Monday or Tuesday nights and get dinner for two for a grand total of $9 — not as cheap as eating at home, but it doesn’t radically inflate our food budget either. It’s not a fancy place, but the food is fantastic, and they have this huge back patio with big shade trees, kids/dogs/people hanging out and playing, live music, and just general awesomeness. For us, it provides exactly what we want most from the “let’s go out for dinner” experience, but without the big price tag. Another idea I never managed to put into practice but which I’m still considering: a cooking club for families. You invite one or two friends to come over. They are looking after their kids and yours while you cook up a huge batch of food. At the end of the playdate you split the food so you each get dinner for that night plus they get 1 or 2 freezer meals to take home. Next time, someone else cooks. This way you get a break from cooking every now and then, and also get to enjoy someone else’s cooking. LOVE the idea of a cooking club! I’ve also heard of a group of friends each cooking at their own homes and then swapping containers of food with each other to add variety. I’ve never done either of these, but they sound like such good ideas! Yes, this is a great idea! We used to do something similar in graduate school. I need to start that again. We’re a vegan household which helps as one of your reader suggestions said and I can sometimes get very low on energy which is always a recipe for disaster. Solution? A well stocked store cupboard with chopped tomatoes, rice, pasta, lentils as well as stock, gravy mixes and herbs and spices galore. My freezer has cooked and frozen beans, veg and always what we call ‘freezer food’, such as burgers, falafel or sausages for an emergency! We also have a second chest freezer where I stock meals like lentil shepherds pie or chilli and have portioned out meals to grab at any time. This evening will be a lentil casserole made ahead of time with rice and there will be plenty of leftovers. Lunch tomorrow will be soup (made in my slow cooker weeks ago and frozen), with snacks of bananas, nuts and seeds and a piece of lemon cake that is currently in the oven! We’ve gone years now without visiting a restaurant, and cooking every single day of the week. It’s like anything — not that hard, but you have to practice. Now, I can cook far better meals than anything we could get in a restaurant in about half the time. Plus, it’s tons cheaper! The trick (I think) is *keeping yourself inspired to cook*. If you get bored, the lack of enthusiasm shows up in your meals. Cook what interests you. Cook what makes you drool on the keyboard. Cook what you have a passion for. The rest of it will take care of itself. One shout out to take out – it’s sometimes better than going out to eat at a sit down restaurant. Once you add in apps, drinks, etc, those meals add up! My husband and I love Chipotle and it’s way more affordable than a sit down meal. We can bring it home and enjoy our own drinks for free. We recently found ourselves stranded waiting for an Apple store repair (3 hours but free luckily!) and we hit up the Whole Foods salad bar because my snack for the car (one protein bar) wasn’t going to last 3 hours. It cost $20 but it was healthier than a sit down meal in the plaza. We never order take out to the house though and always keep a stock of frozen pizzas. Our friend group has also converted to making dinner for the group at each other’s homes. It’s way more fun, the food is better, it’s cheaper, and no one has to look at a bill. We pick a theme and then assign sides or dessert. Homemade pizza, Asian food (one of my favorites), tacos, chicken parm, or grilling are all easy and delicious! We usually only eat out to get “ethnic” food, stuff that is more difficult for us to make at home like Indian, kabob, Korean, Vietnamese (pho or banh mi), or really good BBQ. One nice thing about eating out at these kinds of places is that they are usually “cheap eats” kinds of places. The restaurants are super casual but the food is amazing! Also helps that we are not big drinkers at all, as beer and wine can definitely up the prices of going out. Another bonus – now that I’m more familiar with different ingredients and flavors, it has inspired me to be more comfortable with trying more globally inspired recipes at home as well. I told my husband I always want to live near a college town because they always have such good and diverse cheap eats nearby! Indian food is actually pretty easy – we have a great local Indian cooking class that I’ve taken a few of and you can often find the spices and ingredients extremely cheaply. My mom buys them in bulk at a local store and splits them with us so they don’t go to waste! The person who teaches them also does free sessions at Whole Foods for Indian cooking! So many great ideas! I’ll add one I didn’t see (sorry if it’s a repeat). Learn to make versions of what you like for take out. Sometimes I just get hungry for something specific. So far I’ve mastered a version of Chipotle bowls (especially seasoned black beans and the lime rice), Lo Mein (family favorite), and a grilled chicken salad we love from a local place. Also being willing to have a few junky (not so healthy) homemade meals a month, like fried chicken or really gooey enchiladas goes a long way to making teens (ok and me too) happy with frugal meals. Totally agree. I used to love going to Chipotle for bowls. I located a copycat recipe for their barbacoa beef and never looked back. I make a big batch in the crockpot and freeze in meal-size portions. We recently found a recipe for a healthy, low fat and delicious turkish kebap. I now make it every two weeks. Keeps the kebap cravings, the waistline and money in check. I’d say making the cooking process FUN and having the whole family participate in the process (like top chef or something). It does not have to be a chore. Plus there is something the whole family will be proud of in preparing and enjoying a meal together. Campylobacter from the local Chinese takeaway about ten years ago. Cured FOREVER from wanting a quick takeaway supper. Pizza dough from the bread maker, or rice cooked with frozen veg in the microwave, or a quick Spanish omelette with whatever is in the fridge, or lentil soup- ready in 20 minutes, are my quick and easy standby meals. I’ve taken a similar approach to Kim: make cooking a hobby! I try to replicate our favorite restaurant meals at home. And since my husband is more inclined to dining out that I am, I talk him into eating at home more by telling him that I want to practice my cooking skills. Routine and laziness. When I worked in the office I went to the onsite gym everyday during lunch. By the time I finished the cafeteria was closed, so buying lunch was never an option. Now I work from home most days and don’t pass any restaurants when I pick my daughter up from after care. So it’s a lot less effort to go home and cook something then drive out of my way in traffic. As others have said, it makes going out a treat. My daughter has to get blood drawn, so I’m using Chick fil a as a reward (and 99.9% of that is for the play area). Mr. Mandalay and I go out to eat once a week, but we make it breakfast or lunch. A lot of places have lower prices for those meals, but the quantity is the same and often leave enough leftovers to have for another meal at home. I enjoy cooking and, like others, try to get dishes that would be a pain to replicate at home. Our meals are pretty simple–a piece of grilled or roasted meat with a steamed vegetable or salad, sandwiches, that sort of thing. My favorite quick meal consists of two over-easy eggs on top of a steamed vegetable–the runny yolks make an excellent sauce! I live where there are no restaurants, and I work where there are only a couple. Having very limited options makes it very easy to bring my lunch from home and to eat breakfast and supper at the house….lol. Eating out is generally not a problem for me. We saw how much we were spending and eating out came to a screeching halt. The couple of times we have eaten out since then the food quality was so poor we have come to prefer our(my..I do all the cooking) with the single exception of a family run restaurant. We still go very occasionally but the reason we were still going is for the sauce. The solution, they sell the sauce for $1.50 a pint. We 5 or 6 pints and can feed our family of 6 with other ingredients at home. Far cheaper than eating out. I keep all ends of celery, onions, garlic and carrots in a plastic bag in the refrigerator. I toss this in the crock pot over night with salt and peppercorns…makes the best veggie broth. I bulk produce sunflower butter and jam sandwiches(our kids school bans peanut butter) keep these in the freezer for quick snacks and kids lunch. For my elementary school kid, I bought stainless steel 16 ounce thermoses(the kids plastic thermoses don’t last) for leftovers and soup. I pre-heat the thermos with water than fill it with heated homemade soup, spaghetti, lasagna, enchiladas, whatever leftovers we have. Kids lunches in our area start at $3.5/lunch and with 3 kids in school..that adds up. As a full time worker and a graduate student, meals can be a struggle. Eating out seems to take more time than food prep, but I don’t have the stress of meal planning, shopping, or cooking. And that’s how Papa John’s shows up at our house. So this article was rather timely for me. My goals are fast, easy, healthy meals that don’t cost a lot and that still taste good. Thanks for keeping it real! I work full time and am college my fiance and I have just started our meal prepping and it is so much easier then eating out. Try coming up with your week worth of meals,grocery list, and groceries all on sunday.. or a day you just have off. it makes it so much easier and healthier! I consider it money well spent to go out to eat occasionally. Budget for it and enjoy. Unfortunately, due to a chronic illness I have no choice but to make all my meals from scratch. So I have learned that even with this, meal planning is a must. Snacks are made and stored or frozen for times when I don’t feel up to cooking. Keep it simple. Nothing wrong with eggs and bacon for dinner. And one tip that has helped me is I only do groceries once a week and I buy my fruit and veggies. I don’t want to waste food so if we were to get takeout during the week, my veggies would spoil so I have no choice but to prepare them as planned. That really helps and it’s so healthy anyway that I reap the benefits. Double score! My trick to not eating out? Have kids with multiple food allergies that can’t be accommodated by restaurants! Nope, not kidding. And even though husband and I can eat most places, it just seems wrong to be eating out when the kids can’t. We don’t do fast food, so that’s not even a temptation. I like cooking, but it is hard not to get into a rut. One of my kids is severely allergic to wheat and dairy (among other things), so dishes that are easy standards for most families (lasagna, enchiladas, etc) aren’t possible. One kid is the sole vegetarian in our house. My solution is to make a “base” like pasta, rice, homemade pizza crust + marinara, and then have various toppings available so everyone can have what they want and can eat. We also embrace leftovers and repurposing food (one night we might have roast chicken, then the next it’s cut-up chicken in pasta, etc). Lots of good tips! For us meal planning is key. I hate throwing away food so if we have groceries in the fridge then we’re pretty good about making sure they get used up. With both my boyfriend and I working full-time it can be a hassle getting dinner cooked so we turn to the slow cooker A LOT. Which is also good because it usually makes a big enough portion for dinner and lunches the next day. I do still like to eat out and try out new restaurants around town so we always set aside one dinner out each week, for us that’s a good balance. 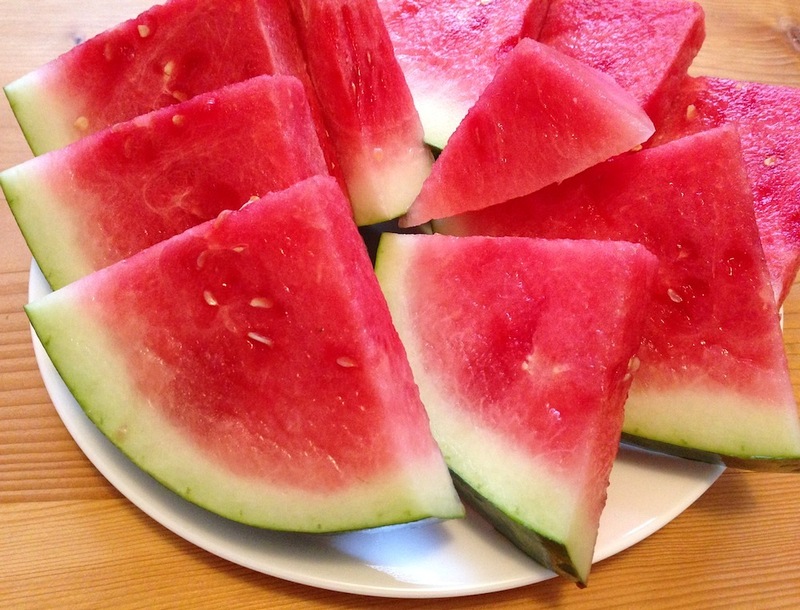 If Kellie quoted in the post is reading — any advice on what to make for “hotel picnics”? I’m terrible about constantly eating out when I travel. There are times when a unique food experience is worth it — but I’ve had too many mediocre chain-restaurant meals when travelling. I’ve done this before, even when eating on my company dollar. I’ll go to a grocery store and get some of their prepped food (pasta salads, chicken salad, etc.) and some of their fresh bread and enjoy in my hotel room. I’ll get enough to last for my stay so it will save me time and on nights when i want to come straight back to relax, I don’t have to think about food. It costs more than if I were to make it all myself, but much less than eating out, and is satisfying. Just keep the leftovers in your minifridge! pack a plate if you plan to do this so you can microwave as needed and can eat like a civilized person :). Occasionally, we’ll stock up on sandwich supplies and have sandwiches and chips and fruit in the hotel, especially for lunches while on vacation and save the eating out for dinner while on vacation to save $ and savor the experience more. Any suggestions on how to encourage one’s partner to eat out less? 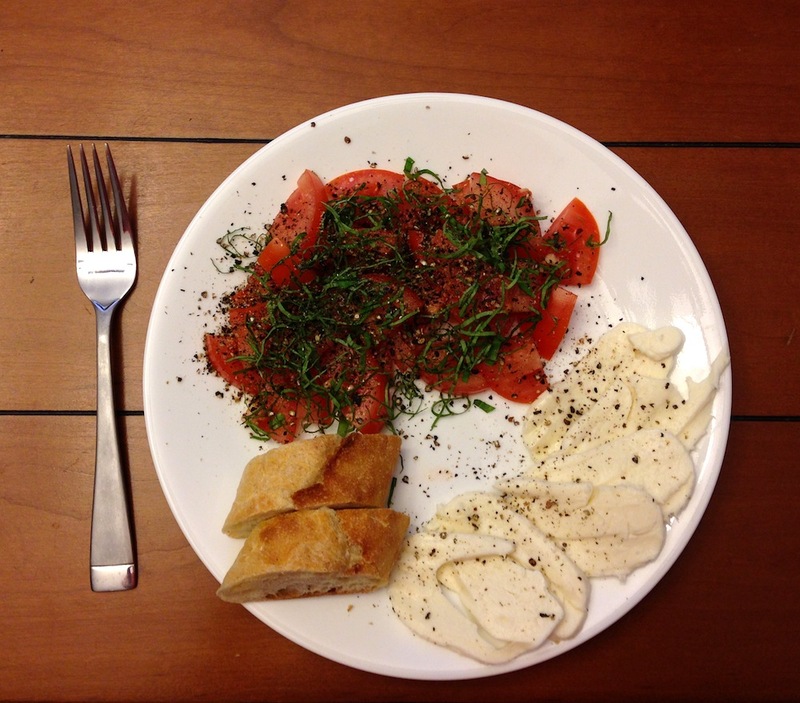 I take my lunch almost every day–use lly leftovers–but my partner eats out almost every day. We’ve discussed this a few times (mostly when he brings it up–I am not one to harp on others spending habits–we all have our things, and honestly, we can afford it). But we’d get to our goals faster, and I think there would be health benefits too. We’ve tried me making his lunch, buying yummy treats to take to lunch, and other thugs. I think it boils down to him wanting to get out of the office. Can you brainstorm other ways for him to get out of the office that don’t involve spending money? I used to take walks during my lunch break and then eat from food from home at my desk when I returned. Good luck! I just wanted to circle back and report some success! My partner (on his own–yeah!) decided to try to buy lunch out less. He went to the store and bought some good goodies for his lunch. Not the most frugal choices, but hey, I don’t mind eating the leftovers 🙂 The key is the habit. And even a prosciutto and jam sandwich made at home is cheaper than one picked up at the deli! Nice compilation of tips and tricks, Mrs. Frugalwoods! Seems another theme might be investing in a few quality tools, both for the cooking itself and for storing and carrying the leftovers. Quality cookware like cast iron pans could last for generations. Pyrex and mason jars make pre-portioning and freezing simple. Adults and kids alike can enjoy choosing a fun lunch bag and reusable beverage containers to transport water or homemade tea or coffee. Including a cloth napkin and real silverware can make it feel extra special and supports the zero waste phenomenon which I’m working toward as well. Even bringing your own mini containers of salt and pepper can fancy it up. As for home, make your dining room/kitchen an inviting and enjoyable place. Play some lovely background music while cooking. Check out different cookbooks from the library and experiment with making your favorites at home. “Date Night In” by Ashley Rodriguez offers some fancy inspiration for couples. “Mad Hungry” by Lucinda Scalin Quinn offers some ideas for cooking for a family. There are so many great cookbooks out there to explore. My first comment here 🙂 My husband and I live in a small island in Indonesia, Southeast Asia, with our son and daughter, 2yo and 4yo. There’s no delivery services here so takeout is not even an option. This island has so many great seafood restaurant but we rarely eat out because with two kids in tow it’s just not practical. And fresh (raw) seafood is extremely cheap here while seafood dish in those restaurants are so so expensive (to my surprise). Both my husband and I have 9to5 jobs so it’s hard to cook dinner from stratch every single night, but most nights I’m able to cook 3 course meal (that’s how we like it) and freeze the leftover for the next day. We usually have veggies soup, rice with seafood (grilled/stir fry/anyway we like it) and dessert. We eat the leftover dessert for breakfast and rice with soup for lunch. If we still have leftover, we throw everything in a wok pan and have fried rice dinner the next day, so we never waste any food. We rarely eat meat or poultry because it’s cheaper to have seafood everyday. We never buy anything past season because they will cost more, and are likely less nutritious (or so I think). For those nights when we feel tired, I make instant ramen noodle with egg for us and scrambled egg/grilled sausages for the kids. It’s not that healthy but it’s easy and delicious. Great tips! I’ll add to the frozen pizza (or frozen batch cooking) fan club- they’re really helpful when we’ve- er- been to the pub and can’t be bothered to cook. Apart from then, I find cooking quite grounding and soothing so making time to cook is important to me. Lunches are prepared the night before (typically they’re leftovers, although I do currently have some soup in the freezer for a couple of days’ time). I have a separate purse for cafe visits (we have a nice coffee-shop at work and I used to get a coffee (and often cake) from there every day). I put 10 pounds in at the start of each month and when it’s gone, it’s gone! This now means that I have a latte once a week (and have it to drink in instead of mindlessly draining it at my desk) and enjoy it more and only have the cake if I really fancy it. I’m considering this for eating out too. Recently converting to a vegan diet we’ve had to really plan meals ahead of time. Many weekends my wife and I will discuss our “big” meals to prep and prepare in order to have leftovers during the week. Our work schedule (and two little ones) doesn’t allow for us to do much cooking during the week. It is totally possible to plan ahead and have everything ready to go!! I definitely agree… eating out is a large drain on money. When I was single, I would cook a large pot of beans with vegetables every Sunday. Let it cool overnight. Monday morning, I would put a meal in the container to take to work for lunch, the rest went into other containers… one in the fridge for the next few days, the rest in the freezer. Once I was down to two meals-worth left in the fridge, I took a container from the freezer and put it in the fridge to defrost. But the time the first container was empty, the second one was defrosted. Not that I am married, when we cook dinner, we always make extra. That provides the meal to take to work for lunch. I enjoyed seeing what other people do immensely. Thanks for all the great ideas. I love cooking and am always up for prepping something new. Or even something old that I know my boyfriend and I enjoy. But that’s only part of the reason we rarely eat out. I’m not a picky eater, I’ll literally eat anything edible! However, the thought of spending money on a meal usually puts me off. Knowing I could make the same meal at home for a fraction of the price is what motivates me to just cook at home and only go out on special occasions. We have almost entirely eliminated eating out from our lives totally by accident! And I really don’t miss it. 1) We had a baby. Eating out is much more difficult. 2) I don’t commute (WAHM) and my husband has a 0.2 mile walking commute that passes exactly 0 commercial establishments. He would have to go way out of his way to pick up take-out, and we’re not inclined to leave the house once we’re home for the evening. Basically, convenience eating out is no longer. Instead of eating outside why not to develop the relations in neighbourhood and have dinner in sitout of each others home by sharing what you cook best.I believe that we eat outside as we want different environment and people around also a food of fifferent taste than usual preparations. This will save money and also increase friends in the vicinity who are from frugal community membership. If you haven’t checked out Budget Bytes it is a great blog for the frugal weirdos out there and she just started a meal prep series that I really enjoy. I don’t know what is wrong with my DH and I, but it doesn’t even enter our brains to eat out. With just the two of us, we usually have something to eat leftover, but if worse comes to worse and we have not planned and are at a loss, DH will make us omelets. I work with an older woman who still works and so does her husband (I’m almost 60 and she is about 15 years older) because they have to. They eat out a lot! I keep thinking if they just stopped eating out and spending on other sh** maybe they could retire. For me the crockpot has been the single best investment in making homemade easy. My simplest go-to is salsa chicken, 4-5 hours on high with two cans of salsa and a package of chicken, adding veggies (my favorite is spiralized sweet potatoes) toward the end. My rice cooker is also a godsend — 30 min or so and I have hot, steamy brown rice – add some veggies or some sausage, or an egg over easy with cheese between the rice and egg, and I have a quick and inexpensive meal. 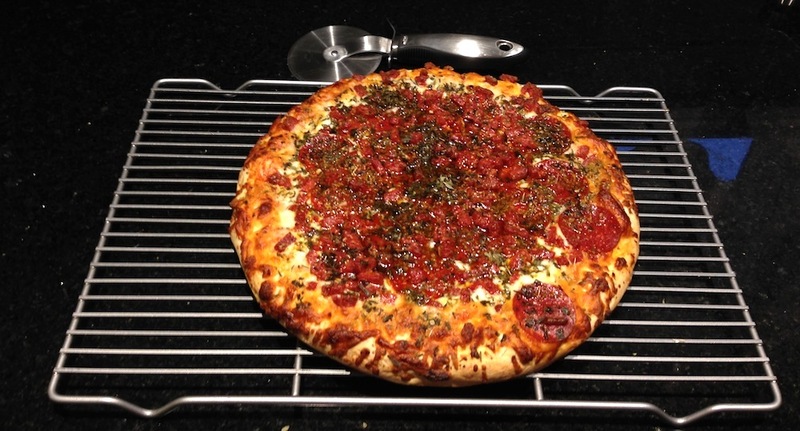 Learning how to make homemade pizza makes for a great weekend treat, and I can make one for about half of what a frozen pizza costs (not time consuming, per se, but requires planning because there’s a few hours in which the dough needs to rise). 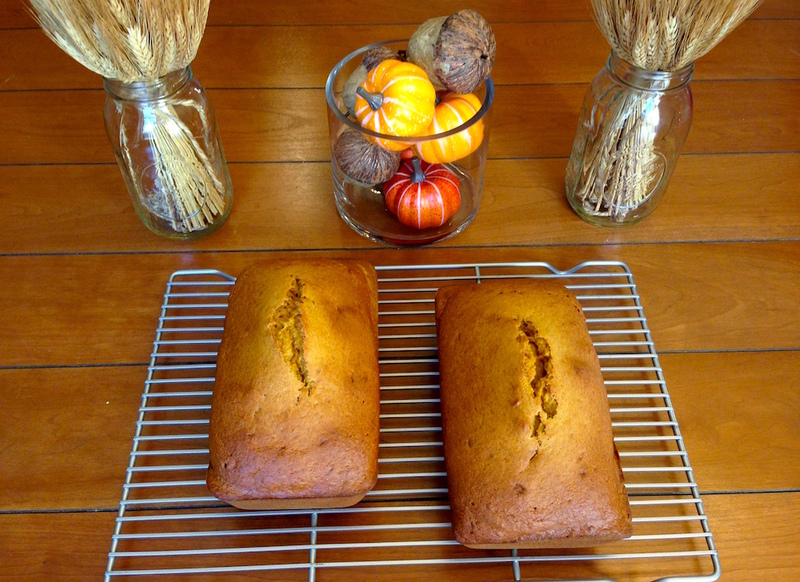 Sometimes I cut with some almond flour to reduce the overall carbohydrates. My biggest challenge is my line of work, which comes with a whacky schedule sometimes. It can be hard to bring enough food for those days when I’m gone basically dawn to dusk. One help has been keeping a big package of raisins in my drawer. I can eat just enough to stave off bad decision brain: when you get so hungry your judgement gets impeded. Sometimes when push comes to shove, I grab a quick salad from our downtown grocery store, which is usually between $3-4 — not that far off what a typical meal will cost me and healthy! I do eat out, but generally I consider it entertainment. For example I go to Pizza on the Farm at one of our local CSA farms once or twice per year, which is a lovely evening out and a summer must. I know some people who do so every Friday, but my frugality would never allow such a thing! We have some great restaurants and every so often I visit one with a friend or family. Every once in a while I slip, but those slips usually reinforce my beliefs. I recently succumbed to hunger decision brain after a long work day and stopped at a local sandwich shop. Nearly $8 and a lifeless, limpy sandwich later and I thought, why did I get this? I could have made something so much better at home! But the occasional slips serve as good reminders of why I am on the frugal path to begin with. The number one thing that helps me stop buying take away, and sticking to my budget, is menu planning. I’m not a great fan of meals out of the freezer so, on the days when l know l’ll be back late l always cook double the night before. I also boil up some eggs to use throughout the week. Being a vegetarian helps, l think, because l can always have a cold boiled egg and salad of some sort. I already do a lot of these things, but was reminded of the importance of stocking away the little bits of leftovers to piece together a meal later. Those little bits can be combined to make a meal later rather than just “cleaning up” and having someone eat the last scoop or tossing it. My grandmother called those “dab-a-dinners”. Everyone gets a dab of this and a dab of that. It works especially well for leftover casseroles, and you can add one fresh thing to make sure everyone gets enough and is satisfied. She also keeps a “soup bucket” in the freezer. Any little bits of broth, veggies with just a spoonfull left, plain pieces of meat, plain pasta or rice etc. all go in the soup bucket in the freezer. When it’s full, it’s time for soup! It’s a hodge-podge kind of soup that is different every time based on the left overs. She might add in a bit more broth or a can of veggies or a piece of meat to balance it out if it seems like it’s missing something, season it up, and bake some cornbread. A general attitude of mind that I have towards food is that I don’t have to have what I want all the time. Sometimes I end up taking odds and ends of food for my lunch and it might not be as nutritionally balanced and tasty as it usually is . I just think , “oh well, it’s fuel”, and am grateful for what I have. When I see the other teachers bringing their pies and coke back from the shops I am very happy to have my frugal food from home. This post came right on time! I was checking my monthly expenses this morning and realized I spent almost 4xs the amount on “dining out” than I did on groceries. The summer months are usually my most expensive since friends and family are always visiting and wanting to “go out”- we live in Boston (rough winters where everyone stays in and balmy summers on the beach). I was so shocked and saddened but I’m not dwelling on it! I went grocery shopping today, making my veggie rice soup tomorrow and whipping out the pyrex for the week! Thanks for an inspiring post, Mrs. FW. When I first started mealplanning, my SO would mock me a little for this housewifey undertaking. After some months, I became frustrated, so I stopped. The result? Two hangry, confused adults trying to decide what to have for dinner at the supermarket at 8 pm. Not fun. My problem isn’t the lack of time or money or knowing how to cook or a husband who won’t eat leftovers, it is that I was raised on McDonalds fish sandwiches every single Friday night. I love them. I crave them. They are my comfort food. I finally made a deal with myself that I could eat them one Friday a month and most months that works…most months. I’ve tried making my own version but it is not the same, there is something about their tarter sauce. Otherwise we eat well and cheaply and virtually never go out except when we go on a vacation and want to eat the local cuisine. For me, it was the McChicken. When something is connected to a comforting childhood experience, it is sooo hard to give up. So maybe, not restricting yourself, but replacing it with a much better experience could work for you, too? You can go really crazy here for a while… 3 course candlelight dinners or barbecue or whatevery suits you every friday night. Something you are looking forward to so much that you don’t want to miss it for the boring fish sandwich. Fortunately, in my city there’s a place near my workplace where meals cost US$2.75 – US$3.75 (and include a beverage). There are a couple of vegetarian places that cost the same or even less (US$0.70/portion of choice). That being said, it could result the same or maybe even more expensive if I try to beat that. But when at home, my best friends are my air fryer and blender… I need to eat as fresh and healthy as possible. My husband and I have a tough time with this a lot of times. Things get busy, and take out is so much more convenient! But seriously, it gets so expensive. It’s interesting to get advice from a whole bunch of people and see what others are doing. The money is an issue, but also health is too. I’ve recently gained a few pounds because of eating out so often. I need to heed this advice and figure out other ways! As I sit at my desk eating take out from across the street. Oops! In all seriousness I am personally having a very hard time in my current season of life. I’m 36, work full time, commute about 14 miles one way, but the commute is horrendous because I’m in Houston, TX, my husband is in school working on second degree full time, and I have a 3 1/2 year old and an 18 month old. 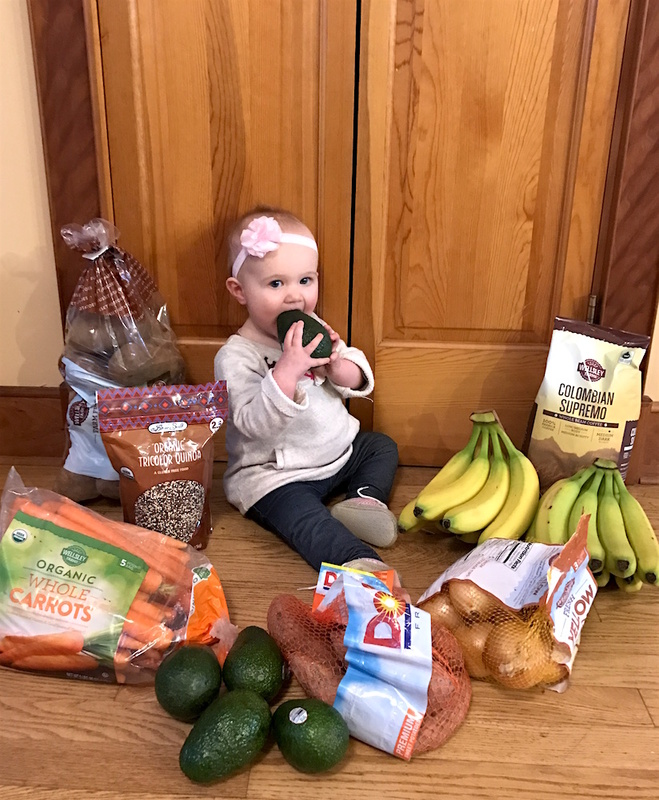 The 3 1/2 year old loves our gourmet dinners but the baby only eats breaded chicken, salmon patties, breaded fish, avocado, tortillas, muffins, cereals, fruits, green beans. It’s really hard to make sure that little one is eating and it’s kind of disrupted the crockpot routine we were in because she won’t eat nada. I don’t know, but the meal prep thing is hard as well. No one said it’s easy but how do you do this with no help around the house and children that don’t nap because that’s my reality. Sometimes I feel like this is another area that we are telling specifically women that they really have to do it all. I’m on the frugal bandwagon but sometimes my sanity is worth more. I really don’t have two hours on the weekend to meal prep. Definitely when the baby is a bit older. Great tips as always and will continue reading all your posts. Hope by this time next year when husband is out of school I will once again have some peace. 2 – for probably about 50% of our work-night meals, we sit with the kids as they eat, and my husband and I sit down to eat together after the kids are in bed. I don’t view it as more work, necessarily, because the meals we throw together for them are pretty simple (‘breakfast for supper’ is a popular one, or a quick pasta and pesto meal). We generally split the responsibilities of going through the bedtime routine, and putting together our evening meal (“can you turn on the oven? I’m brushing their teeth”), and find that works well for us. 4 – Just do your best, and don’t compare yourself to anyone else. One of my friends feeds her kid organic everything and zero junk food. Another one gives her two-year old suckers. It’s super easy to compare ourselves to what everyone else is doing, but try to do what works best for your family, and work on fine-tuning things as you’re able. Thank you for this post! We stopped eating out a few years ago when we had to cut our expenses. It was a gradual cutting back, and we eventually just stopped completely. We also discovered that the restaurants we really loved just weren’t as enjoyable to eat at now that we had three young kids. We were always checking on them in the play area, and inevitably our food got cold. It just wasn’t worth the money any more! I hope one day my husband and I can go out as a couple, and really enjoy it again – once the kids are older. I have to admit I love to eat out. I like when someone else cooks for me, but all the meals out, or even, having takeout in, has not been helping our bank accounts, and with some large purchases looming in the horizon, we really need to reign in the non-essential spending. I’m definitely going to try meal planning for the week, and cooking extra to freeze. I think keeping a few frozen options will help as well, so that there is some choice, and maybe I’ll finally use the crockpot. I’m just hoping that we can break the habit and stick to it. Like what Sevilla said, what you eat out is what you don’t normally prepare at home. That’s what I do when I order as a restaurant customer. But of course, you still get to save more when you cook at home large portions of food then save some for other days or bring DIY lunch to your workplace. Oddly enough we felt switching from Chicken protein to Tofu helped in our quest to stop eating out as much. There’s a lot you can do with that protein! Great article! Living in Cambridge as you did, I can imagine how hard it was to “pretend” there were not great places to eat all around you. I used to live in Davis Square (Anna’s!!!!!) and then as recently as last year, downtown Portland, ME. Random “walks” for exercise had a way of turning into $60 dinners, including 2-3 craft beers. Thankfully, the closest thing to us now is Domino’s. And while convenient, we never feel great after on the occasion that we give into the $7.99, 3-topping large take-out deal. If you have the room for a garden that’s the best way to save money on groceries–especially if you grow berries and other fruit in addition to veggies. You can use many of the trees and bushes as landscape plants instead of ornamentals–and probably for less money. I planted a row of rhubarb (about six plants) for somewhere around $40. There were years I’d get 40 lbs to put in bags and freeze for cobblers and give away. Rhubarb is about $5lb at the grocery store so in just one year what I planted was worth $200–multiply that by 5 years and it’s $1,000 for $40 worth of plants plus water. A $40 semi-dwarf peach tree can yield up to 5 bushels–which equals about 200+ lbs. At $45 a bushel at a local fruit stand that’s $225 every summer for years from that $40 tree. Peach trees live about 15 years so that’s almost $3400 worth of peaches. 5 bushels of peaches make approximately 35 home canned pint jars–with a lot of peaches in each jar. Assume 1 pint home canned jar equals 2 16 oz cans–about $3. So, for a $40 fruit tree plus water, sugar ,jars and lids you could get the equivalent of $450 worth of commercially canned peaches for half that amount for delicious, fully ripe, lightly sweetened for peaches. Over 15 years that’s $6750 worth of canned peaches for $3375. Home grown blackberries and raspberries are a zillion times better than store bought at Costco. You can buy a plant for about $6–sometimes what a half pint at Costco costs. And..ugh..store bought tomatoes are gross when compared to home grown. A .20 tomato seed can turn into 20-40lbs of tomatoes. You can start the plants on a sunny window in winter and plant them outside when it’s warm. Keep multiply this year after year and you can see how much you can save by growing and preserving your own produce. You can also save lots of money by giving jars of homemade jams and jellies as gifts for pretty much the cost of the sugar, jar and lid. I’m no super hero or Wonder Woman but I was able to can a considerable amount when I worked full time plus took college classes. (During those years I didn’t have a garden so I bought my produce at local fruit stands. 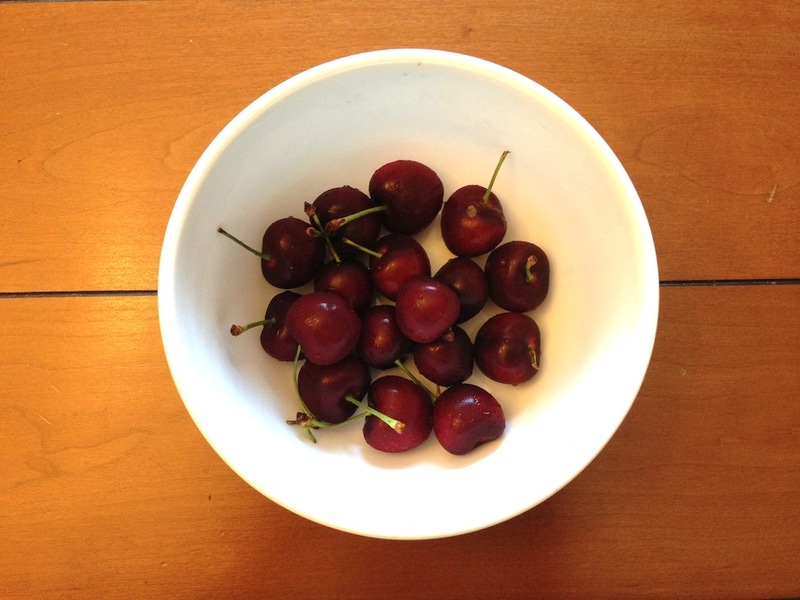 I also gleaned some free fruit and bought “seconds.”) It just was a priority (after family, of course) so I found the time and energy to do it. Oops…I think my post should have been for a different article about preparing home-cooked meals. Hubby and I are homebodies and don’t really enjoy actually going out to a restaurant, but we both love Chinese and found a wonderful (though high-end) local Chinese restaurant that delivers. A dinner portion for hubby and if I decided to order sushi, we could easily spend $60 before tip and did this a few times/week (in addition to buying groceries!). We initially cut this habit way back, but with some health issues that needed addressed, we have totally stopped ordering there, and even stopped eating out on the rare occasion when we actually did go to other local restaurants. Quite honestly, aside from the frugal aspect, we feel SO much better. We enjoy eating very simply (and have come to LOVE Aldi), we’ve lost over 150lbs between us and have a nice chunk of change to put into savings each month. I’m wondering if Mr. FW’s Chicken Chili recipe is shared anywhere on your blog. If not, can I have it? I am drooling over here. We are one month into our goal of a year of not eating out. So far so good, but some Chicken Chili would definitely help. Thanks for all you do!